Domestic abuse affects around 1 in 5 children in the UK. The damaging effects can be long lasting and impact on every area of children and young people’s lives. The research project ‘Boys to Men’ also found that nearly half of boys and a third of girls aged 13 – 14 thought hitting a partner would be ‘okay’ in certain scenarios. One Stoke-on-Trent based charity, Arch, is on a mission to break this cycle of domestic abuse by reducing the likelihood of children and young people experiencing it in their current and future relationships. 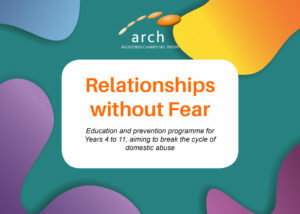 ‘Relationships without Fear’ educates pupils about healthy and unhealthy relationships, emotions and unsafe secrets, with issues of grooming and consent raised in the secondary schools programme. The programme has been taught at Stoke-on-Trent primary, Clarice Cliff, for six years. Since then, staff­­­ have seen a huge difference in the pupils’ behaviour. ‘Relationships without Fear’ is available as a four or six week programme, with tailored courses for Year 4 up to Year 11. Prices start from £325 per programme and include a full evaluation at the end, documenting the impact and outcomes. It’s currently open to schools in North Staffordshire, Cheshire, Shropshire and Derbyshire. Arch is running a free event for teaching staff on 6 February 2019 in Stoke-on-Trent for eligible schools. As well as learning more about programmes, they will be running a Domestic Abuse in Education Awareness workshop, which will give educators a better understanding of domestic abuse, the impact on pupils and their education.